Flo Filion Meiler is a world-class athlete who lives in Shelburne, Vt. At the indoor World Masters Athletics Championships in Poland last week, Meiler, who is 84, racked up medal after medal in her age division. Golds in high jump, pentathlon, 60-meter hurdles, and pole vault. Silvers in long jump and triple jump. Oh, and another gold in the 4x200 relay. "The four of us ladies in our 80s set a new world record," she told NPR this week. But wait — the pole vault? Flo Filion Meiler, 84, during pole vault training last month. She mostly works out alone, but has a coach to help refine her technique in events like shot put and high jump. Indeed. 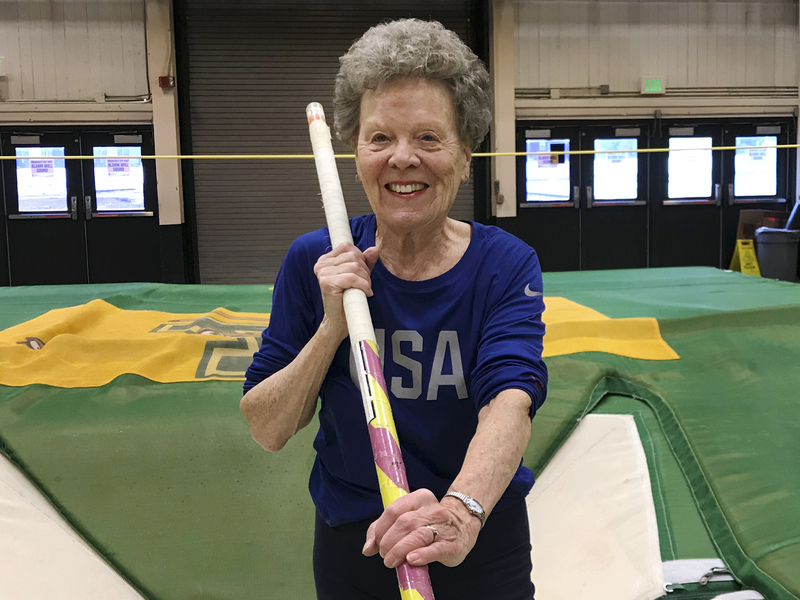 Meiler took up track and field at age 60, and as she watched the pole vaulting competition at the Senior Olympics, she had a notion. "They weren't pole vaulting very high," she remembers. "And I said to myself, you know, I think that I could do better than that. So at a sprightly 65, she took up the event. "I love challenges, and the pole vault is a challenge. You have to have a really strong upper body, upper core and very strong arms." No problem for Meiler, who was competitive slalom water-skier for 30 years. "I think that's why I've done so well in it, is because of the way I've always handled my body." At last week's world championships, she was the only pole vaulter in her age division, though there were a few men in the 80-84 field. Meiler notes that she was far from the oldest athlete taking part in the meet. "There was a lady from India who was 103. ... She didn't run very fast, but she did it!" All that winning takes a lot of training, and Meiler keeps a rigorous schedule. She says no longer has time to ski, as she devotes herself five to six days a week to her workouts. "On Mondays, Wednesdays and Fridays, I will do track events. And on Tuesdays and Thursdays, I will do machine weights. Then I will play doubles tennis, but that's just social tennis." She mostly trains alone, but she has a coach at the University of Vermont to help her get competition-ready. "I have her help me, let's say, with my shot put. And I have her help me doing the high jump and so forth." A year ago, she started having hamstring problems and knew it was due to getting older. So she doubled the time she devotes to stretching and warming up. "It makes a world of difference in not being injured," she says. The competition may be thinning, but Meiler doesn't see retirement anytime soon. "You know, if the good Lord gives me my health, I'm going to keep going forever." Right now she's focused on the upcoming Senior Olympics in Albuquerque, N.M., and she's eagerly anticipating her birthday in June – an occasion that will shift her into the next age bracket. "I'm looking forward to being 85," Meiler says, "because then I'll be at the bottom of the ladder, and I'm going to look at all these records and see what I can do about 'em." NPR's Sarah Handel and Art Silverman produced the audio version of this story.